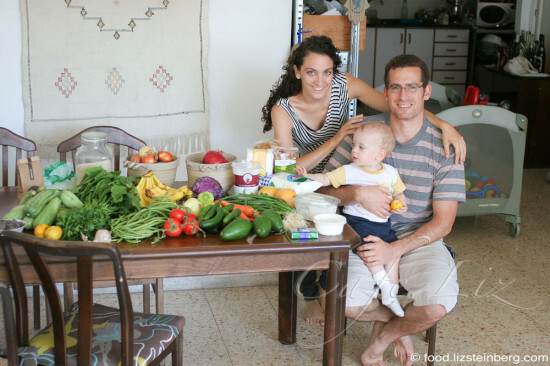 How much does the average family spend on groceries in Israel? It depends who you ask, but figures seem to vary widely. The question was recently raised on several online forums. Some people claimed their families couldn’t get grocery expenses under NIS 3,000 or NIS 4,000, while others said they spent under NIS 2,000. I undershot them all — NIS 1,000. Obviously people questioned that, so I started wondering whether I’d gotten it wrong. Could it be that I was sorely underestimating? So I decided to find out exactly how much we’re spending. For four weeks, I recorded everything we bought, when we bought it, and everything we cooked — with the exception of the oatmeal my husband and son eat for breakfast and the occasional scrambled egg. It turns out my estimate was pretty accurate. In 4 weeks we spent NIS 860. Given that the average month is 4.3 weeks, that works out to NIS 925 in a month — $260 or 192 euros at the current exchange rate. Admittedly, that’s not the complete picture. We ate out as a family once a week, and my husband buys lunches at the office cafeteria. Once you factor in restaurants (which I consider our entertainment budget) and my husband’s lunches at work, our total food costs came out to NIS 2,000. Not low, but not bad. In fact, it’s not bad at all given that I recently saw someone state that NIS 900 a month in groceries per adult is standard. I know some families have complained that they can’t get their monthly food expenses were closer to NIS 3,000 or NIS 4,000 — and not necessarily because their households were larger than ours — while I also know of families that feed more people for considerably less than what we spend. There are a few factors lowering our grocery costs. Our household consists of 2 adults and 1 toddler, who probably eats 1/3 to 1/2 of what we eat. We did very little hosting over the past month. Our diet at home is mostly plant-based — lots of grains, legumes and vegetables at home, plus a small amount of dairy, some of which is under government price control. We eat nearly no processed food — I make almost everything myself, including most of the bread we eat (it’s less time consuming than you’d think). We shop at the shook nearly every week, and I often go close to closing time on Fridays, when produce is cheapest. And also worth noting, when referring to grocery bills, I’m referring only to food — no diapers (we use cloth, anyway), soaps (we buy less than once a month), pet food (we don’t have pets) or other things people lump with their grocery costs. And there are factors raising our total food costs: We buy organic eggs and whole wheat pasta. We live in Tel Aviv, and the stores in our neighborhood are breathtakingly expensive. Sometimes the cost of getting to a cheaper grocery store outweighs the savings of shopping there. We like eating out (you know, Tel Aviv) and go out as a family at least once a week. And most importantly, we’re not trying to be overly frugal. I don’t cook every day. On days I don’t cook, we eat leftovers or things that don’t require much preparation, such as bread, cheese, eggs, chopped salads, fruit and raw vegetables such as avocados. We also did a pretty good job of not letting food spoil this past month. Here’s what I learned from this project. First, we ate out more frequently than I thought we do, but actually spent less on restaurant meals than I’d thought. Not counting breakfasts or food for my son (I’m presuming these expenses were minimal), we ate nearly 25% of our meals outside the home (7-9 adult meals a week). If we’d eaten those meals at home instead, it probably would have cost us another NIS 280 on groceries, meaning our total bill would have been NIS 1150. On the other hand, we would have saved the nearly NIS 1,000 shekels we spent on meals outside the home. Now, let’s say this was an exercise in frugality (it wasn’t). We could eat perfectly well without aged cheeses, gourmet coffee, beer and probably also without expensive vegetables like spinach, broccoli, green beans and 10-shekel-a-kilo tomatoes. We could buy regular eggs instead of organic. We’d also cut back on going out or stop eating out entirely. My husband would start packing his lunch. Without all these things, our total bill would have come out to NIS 925. What do other people’s shopping habits look like? One friend says she likely spends on herself what we spend on our entire household, and notes that while her shopping cart contains no meat, she buys more dairy including expensive cheeses and also meat substitutes like seitan. Alternately, we figure that a family with 3 teens that eats meat once a day could be spending NIS 1,500 a month on meat alone, presuming one kilo a day at NIS 20 (chicken) to NIS 50 (ground beef) a kilo at a discount grocery store. So how do your expenses measure up? Anyone else willing to break down their family’s shopping habits — anonymously or not? What are you getting for your money? Some disclosure about the photo: Obviously it was inspired by the “Hungry Planet” project (if you’re not familiar with it, you should be — Time has some of the photos here). 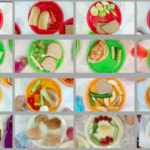 I was hoping it would be representative of what we eat at home over the course of a week, although I realized afterward I’d forgotten some things like lentils and eggs (and by then my son was chewing on the lemons). We use way more tomatoes, but I cooked 2 kilos of them the night before. As for the conspicuous lack of junk food — we eat most of our junk outside the house, such as a pastry at a coffee shop, juice at the market, a cookie from friends in the park and maybe the occasional candy bar at the office. But I’m pleased to conclude we actually don’t eat much junk at all, and we don’t keep it around the house. Total spent on groceries: 118 shekels. Dairy products: 30 shekels. Produce: 48 shekels. Other: coffee beans, 48 shekels. I happened to make a few big purchases right before I started tracking expenses — including several kilos of flour and oil — so we bought very little this week. We bought 2 liters of milk (10 shekels), and had a big shook trip that included 3 kilos of pomegranates (a rather expensive 20 shekels), 1 bunch of Turkish spinach (10 shekels), 1 kilo of bananas (7 shekels), 3 bunches of fresh herbs (8 shekels), labaneh and sheep feta (20 shekels in total), plus 250 grams of coffee beans from my favorite gourmet roaster (40 shekels — a splurge, of course). Total spent on groceries: 205 shekels. Dairy products: 64 shekels. Produce: 80 shekels. Grains and starches: 42 shekels. 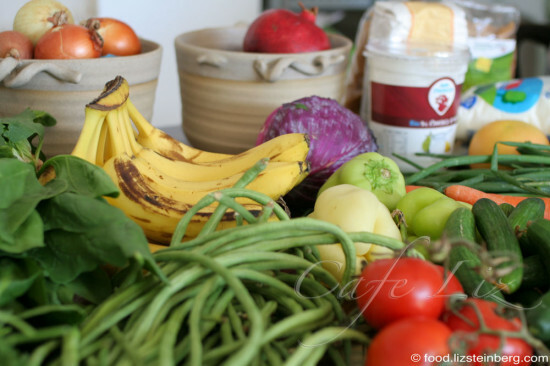 Prepared foods: 20 shekels. We bought a bit more this week, doing our shopping at Eden Teva Market (Israel’s version of Whole Foods), Osher Ad (a deep-discount store catering to the Haredi market in Bnei Brak) and the shook. At Eden Teva we bought 1 liter buffalo yogurt (20 shekels), 3 bags of whole-wheat pasta (19 shekels), 1+ kilo of oatmeal (9 shekels a kilo), and 2 bags of milk (10 shekels). At Osher Ad we bought 1.5 kilos of potatoes (4 shekels a kilo), 1.5 kilos carrots (3.5 a kilo), and one bag of ptitim. At the shook we bought 400 grams labaneh (14 shekels), 200 grams parmesan (20 shekels), 2 kilos sweet potatoes (a cheap 5 shekels a kilo), 1 kilo peaches (12 per kilo), 1.5 kilos of very nice tomatoes (an expensive 10 shekels a kilo), 3 avocados (7 shekels total) and also bananas, fennel, beet, cucumber, eggplant and oranges. We also spent 7.5 shekels on 5 pitas (somewhat expensive), and 20 shekels on very good hummus. Total spent on groceries: 294 shekels. Dairy products: 110 shekels. Produce: 90 shekels. Grains and starches: 24 shekels. Prepared foods (including breakfast cereal): 38 shekels. Beer: 32 shekels. This week we also did our shopping at Eden Teva and the shook, though we bought a few “luxuries” that significantly raised our costs. On the other hand, we did our shook shopping late Friday, which significantly lowered costs. At Eden Teva we bought 1 kilo oatmeal (9 per kilo), premade tomato sauce (9 shekels), 2 liters of milk (9 shekels), 1 liter buffalo yogurt (20 shekels), 2 boxes of cereal (luxury #1 — on sale but still 29 shekels), and 2 bags of whole wheat pasta (14 shekels). At the shook we bought some aged gouda (luxury #2 — a whopping 200 shekels a kilo) and roquefort for a total of 56 shekels, labaneh and parmesan for another 25 shekels, broccoli (10 shekels), 1 bunch Turkish spinach (10 shekels), half a kilo green beans (10 shekels), 2 kilos pomegranate (10 shekels), one 1.5 kilo melon (10 shekels), 3+ kilos of onions and zucchini (9 shekels), 5 bunches of herbs (10 shekels), and also citrus, cucumber, banana, avocados and a 750-milliliter bottle of boutique Israeli beer (32 shekels). Total spent on groceries: 266 shekels. Dairy products: 32 shekels. Produce: 110 shekels. Grains and starches: 94 shekels (including a large pasta stockpile). Eggs: 20 shekels. Things we ate but didn’t buy this month: Rice, oil, flour, sugar, dates, honey, tahini, baking chocolate and spices, all things purchased in bulk less frequently than once a month. Pricewise, I figure the 10 bags of pasta now sitting in my pantry compensate for all these things. Total for 4 weeks of groceries: 863 shekels. Total cost of Eitan’s lunches at work: about 420 shekels. Total cost of meals out: 750 shekels. Where to buy food in Tel Aviv What do Israeli children pack for lunch? 8 Responses to "What we spend on food in a month"
This was facinating. I buy for myself only, and also eat vegetarian and keep junk food mostly out of the house (through I do like chocolate). I spend about the equivalent of about 420 shekels per month (at current rates), with the occassional eating out (or impromptu cooking) raising that to 470 to 520 shekels or so per month. Most of my shopping happens at Whole Foods on Fridays, because the quality of the vegetables seems so much better, and they have specialty items that I like to buy. 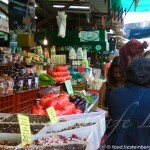 Having read about your shuk runs, I’m curious about doing more farmers’ market shopping. We don’t have them year round, though. I buy just for myself (a vegetarian) and live in Jerusalem. I get all of my produce, dry goods, pita, and spices at the shuk (and I go in the evenings when it’s cheaper) My weekly spending there is around 50nis. Once a month I also buy a flat of eggs at the shuk for 29nis. On special occasions if I come in well under budget, I’ll pick up a block of bulgarit for 10nis. We spend close to the same amount as you three do. My husband is a vegetarian and I try very hard to limit my chicken consumption. I also do not buy that much dairy food. I should add we are very seasonal-produce eaters, meaning we buy what’s in season, which is usually peak in taste and lowest in price. If tomatoes or cucumers are crazy expensive then we don’t buy. On the other hand, we can buy 5 kilos of ‘secondary’ tomotoes at reduced price, the best for sauces. I need my weekly fresh fish ‘fix’. I’ve stopped buying cow produce and I buy usually goat, expensive but kinder to my stomach and tastes so much better. All spices, nuts, legumes I buy in south TLV by the kilo, specialty stuff direct from the importers. Anyways, absolutely love the article and am going to log our future habits. The very least it will prove interesting reading as yours exceedingly was- well done, good job! I am so glad to find your blog. I just moved to Israel and I find grocery prices are so expensive as compared to where I was living previously. Thank you for the insight! yesterday i bought an avocado, lettuce, a red onion and 2 tomato. 48 sheks in the makolet near my apartment in basel. seems like a lot, right?